Race History of the 2018 RN Irwin Stakes at Morphettville on Saturday shows it isn’t always a great Goodwood guide for the winner. 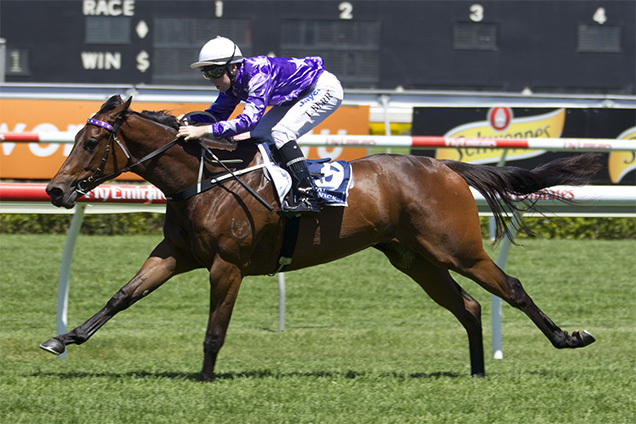 Driefontein was a tough mare for Gai Waterhouse winning it in 2014. Who takes the 2018 RN Irwin Stakes (1100m) at Morphettville on Saturday? The RN Irwin Stakes is a Group 3 race conducted by the South Australian Jockey Club at Morphettville racecourse in Adelaide. The RN Irwin Stakes is run under weight-for-age conditions and is named after a former chairman of the South Australian Jockey Club. It is the only weight-for-age Group race run during the Adelaide autumn carnival. The RN Irwin Stakes was first run as the Gothic Sprint over five furlongs from 1955-1959 under handicap conditions and as the Gothic Stakes over six furlongs/1200m from 1960 to 1974. It became a WFA event under its current title of the RN Irwin Stakes in 1975 when the distance became 5 1⁄2 f.
In 1980-81 it was held over 7 1⁄4 f at Victoria Park; 1982-1985 was run again over 6 f; and in 2001 (Victoria Park) and 2002 (Cheltenham) the distance was 5 f.
The RN Irwin Stakes was originally run in January but was moved to the autumn as part of the changes to the Adelaide Cup carnival in 2006 and serves as an important lead-up race to Adelaide’s major sprint race, the Group 1 Goodwood Handicap. The RN Irwin Stakes was a Group 2 race from 1980 to 1990 and has been Group 3 since 1991. The 2018 RN Irwin Stakes will be run over 5 1⁄2 f at Morphettville for prizemoney of $120,000. Only two sprinters have won the Irwin Stakes/Goodwood double – Sleep Tight (1958) and Bomber Bill (2003). The RN Irwin Stakes has been won by 11 fillies and mares since it became a WFA event in 1975. Viddora won in 2017 then was second in the Sangster, second in the Moir, fourth in the Manikato and won the Winterbottom – all at G1 level. The last 3YOs to win the RN Irwin Stakes are Regal Kiss (filly, 2002) and Kenvain (colt, 1994). The 2017 RN Irwin Stakes was won by Viddora from Illustrious Lad and I Am Gypsy.